Central Area will continue to be a dynamic city centre where job and business opportunities abound, a playground with endless options for all, and where homes are just a walking distance from work and play. The CBD will continue to be rejuvenated with an increasingly diverse mix of uses due to the injection of residential, hotel and retail uses from new developments. A new retail & entertainment spine along Bayfront Avenue in Marina Bay will add retail and entertainment diversity to our city. To further enhance intra-city and island-wide connectivity, the MRT network will be doubled and there will be improvements to the commuter journey. In the next 10 years, developments in the Central Area will be within a 5-minute walk, on average, from an MRT station. A network of dedicated cycling paths will be implemented in the Central Area, to promote cycling as an alternative mode of transport. In the next 15 years, more housing will be built in city locations such as the CBD, Marina Bay, Marina South, River Valley, Pearl’s Hill, and the Ophir-Rochor area. Every development will be within a 5 to 10 minutes’ walk to transport nodes, shops, restaurants, cultural attractions and recreational spaces. Within the Central Region, there is already a wide variety of housing options to choose from. Homes in the Central Region will benefit from the convenience of being in mature towns as well as near public infrastructure such as MRT stations. Exciting new housing districts - such as Kampong Bugis and Bidadari - will also be opened up. There will be new public housing projects in Queenstown, Toa Payoh and Bukit Merah towns, such as SkyTerrace@Dawson, City Vue@Henderson, Toa Payoh Crest and Tiong Bahru View, allowing more people to enjoy the amenities, convenience and character of these familiar towns. As part of the Housing & Development Board’s (HDB) Remaking Our Heartland (ROH) initiative, the Dawson developments will feature new housing concepts such as Multi-generational Apartments, Housing in a Park and Skyrise Community Spaces. Upcoming private housing developments such as Echelon, D’Leedon, Leedon Residence, Corals at Keppel Bay and a new residential development at Kim Tian Road will also be completed over the next few years. Over the next 10-15 years, new public and private housing will be developed around existing and upcoming Mass Rapid Transit (MRT) stations such as Mattar, Geylang Bahru, MacPherson, Dakota and Caldecott, where residents can enjoy improved accessibility to public transport. To meet housing demands for a growing population, Bidadari Estate will be developed into a new public housing estate with a distinct character and sense of history. Envisioned as a tranquil urban oasis, the planning of Bidadari Estate will build on the area’s rich heritage, cherished existing green spaces and multiple public transport links to create a garden living environment. Kampong Bugis will be developed as a high-density waterfront residential area in a lush garden setting with accessible public and alternative transport links to reduce car usage. Located between two river channels leading directly into Kallang Basin, Kampong Bugis will be an exemplary water-sensitive urban design precinct. We also envisage future residential developments with creative ‘fence-less’ designs that facilitate public enjoyment of the area. 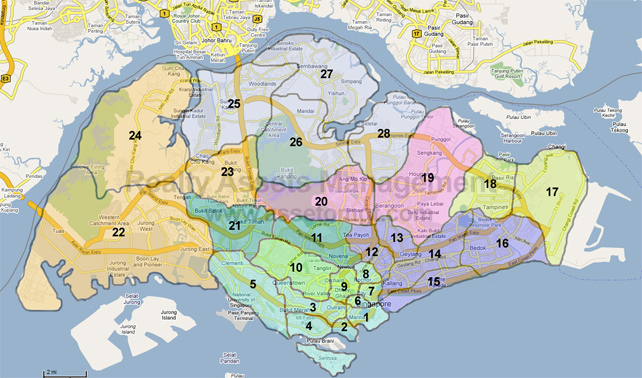 ​Click on the link to see more detail on urban & development planning in Central Area and Central Region. The Eastern Region has a varied housing landscape that offers diverse housing options for everyone. Public housing estates like Bedok, Tampines and Pasir Ris provide affordable and convenient housing options. At the same time, the Eastern Region is renowned for its seafront housing just steps away from East Coast Park. Lakefront housing in front of Bedok Reservoir and a mix of low rise condominium and landed housing across the region complete the picture of a livable and desirable living environment. Tampines North is the fresh face of a well-developed area. Built as an extension of Tampines, the town will feature a new linear park linking it to the existing Tampines Eco Green and Sun Plaza parks. Tampines North will also have a spread of amenities including a commercial centre, community club and primary and secondary schools. New HDB developments are also under construction and being planned for mature estates in the East, to ensure their rejuvenation and provide couples, families and singles the option of living closer to their parents. In terms of private housing, the East Region will continue to see new options being made available from conveniently located condominiums near MRT stations to waterside developments near the sea. Residents in Bedok can look forward to an exciting new set of commercial, social, sports and recreational activities in the rejuvenated Bedok town centre, including the new Integrated Transport Hub (ITH) with the Bedok Mall by CapitaMalls Asia, a new Town Plaza and hawker centre, as well as new sporting facilities at the existing Bedok Adventure Park which will be redeveloped. The East Region will benefit from significant improvements to public transport and roads, with new MRT connections cutting journey times and road improvements to reduce traffic congestion and improve connectivity between and within towns. New cycling routes will also encourage sustainable transport among the public. ​Click on the link to see more detail on urban & development planning in East Region. Residents in the North-East already enjoy a wide range of housing choices, as well as amenities in close proximity to homes. New public and private housing will be introduced to provide greater choice for residents, while new amenities and community facilities will be developed over the next few years to enhance the quality of life. In Punggol, new projects with an eco-friendly focus represent a fresh, exciting approach to quality housing. Recently completed homes such as Treelodge@Punggol already incorporate green features such as solar panels and rainwater harvesting. Future developments in Punggol will build on these eco-friendly design principles. Seven distinct waterfront districts, well-integrated with amenities, will be developed in the town, each with a unique theme. These districts will also be set amongst greenery and planned for walkability. In Sengkang, new private homes around Jalan Kayu will be built alongside a network of neighbourhood parks. These homes will reflect the natural charm of the area. A wider range of housing will be developed in other towns, including Serangoon, where new developments such as The Scala (left) and Seletar Park Residences (right) will provide a new set of housing choices for aspiring homeowners. The Sengkang West area will welcome the addition of new public housing choices that are integrated with common green spaces and precinct amenities. Future residents will find it a breeze to get around with the LRT stations close by. In Sengkang Central, new HDB projects such as Compassvale Boardwalk and Compassvale Mast as well as new private housing including The Luxurie and La Fiesta will provide new homes in the heart of Sengkang within close proximity to Sengkang MRT and the Town Centre. ​Click on the link to see more detail on urban & development planning in North-East Region. New homes near parks, reservoirs, and the sea extend the serenity of living across the North. Upcoming family-oriented developments like 3Gen flats as well as people-centric facilities, activity centres and services are also set to boost community life in the North. New homes along the waterfront such as EastBank @ Canberra, the new Build-To-Order development in Sembawang along Sungei Simpang Kiri, are located close to existing residential areas. This proximity will help new residents maintain connections to family and friends. New public and private housing developments offer diverse options for all who wish to build a home amid the greenery and waterways of the North. Middle-aged housing estates such as Yishun will be rejuvenated through the Remaking Our Heartland (ROH) exercise launched by the Housing & Development Board. Residents can look forward to a new commercial and residential development integrated with an air-conditioned bus interchange, as well as the first Community Club located in a shopping mall, sited conveniently opposite the Yishun MRT station. The upcoming Thomson Line (TSL) will include three MRT stations in Woodlands and one station in Springleaf. When the new line is completed between 2019 and 2021, residents will enjoy more direct journeys to the city. ​Click on the link to see more detail on urban & development planning in North Region. ﻿Featuring a variety of public and private housing options, the West Region is currently home to more than one million residents. The main residential towns of Bukit Batok, Bukit Panjang, Choa Chu Kang, Clementi, Jurong East and Jurong West are well served by recreation spaces, schools, healthcare facilities, parks and shops. Flats and private homes will also be developed in Clementi and Jurong West to cater to the diverse needs of our population. Upcoming developments include Trivelis, Lake Vista, Seahill and The Vision. Residents in the West Region will continue to enjoy a high quality living environment. Existing amenities will continue to be upgraded, while new facilities and services will be introduced with housing developments. Over the next few years, HIllvew and Keat Hong estates will welcome new community clubs featuring a wide range of lifestyle programmes and activities. Residents can look forward to two new hawker centres which will also be set up in Jurong West and Bukit Panjang. Mixed-use developments near transport nodes such as MRT stations and bus interchanges will offer residents a greater variety of retail, food and beverage, and entertainment options. These developments include Junction 10/The Tennery, The Hillion Residences and The Hillier/hillV2. New HDB developments now also include child-care facilities, shop clusters, minimarts and convenience kiosks to meet day-to-day needs. New health and medical care facilities will be put in place to serve the growing healthcare needs of our population. The Ng Teng Fong General Hospital and the Jurong Community Hospital will begin operations in end-2014 and 2015 respectively. The Ren Ci Nursing Home in Bukit Batok will be ready in 2015. A new polyclinic will open at Jurong West Street 61 in the next few years. The completion of the Downtown Line 2 (DTL2) in mid-2016 will improve access for residents in the Choa Chu Kang, Bukit Panjang, Dairy Farm and HIllview areas, leading to shorter journeys to the city centre. The Jurong Region Line (JRL) which is being planned will connect areas such as Jurong West, Jurong Industrial Estate, West Coast, Choa Chu Kang, Tengah and the main activity hubs at Boon Lay and Jurong Gateway. In the longer term, the Cross Island Line (CRL) will provide commuters with another alternative for East-West travel, in addition to the current East-West MRT Line, significantly reducing travel times and improving journey comfort between Jurong Industrial Estate, the West Coast and Clementi areas and the eastern parts of Singapore. The westward extension of the East-West Line (EWL) to Tuas, to be completed by 2016, will improve access for workers to the Tuas Industrial Estate. New transport hubs that integrate MRT stations with bus interchanges are currently being planned or built in Jurong East, Bukit Panjang and Joo Koon. When completed in the near future, commuters will be able to switch between different modes of public transport seamlessly and conveniently. ​Click on the link to see more detail on urban & development planning in West Region.